500+ corals will be heavily discounted up to 50% OFF! Some will even be $5 or $10! We know you want to watch the game so corals will be posted on our website at 11 AM, 4 PM and 9 PM EST. Make sure you're ready when the corals drop, they're gonna go quick! Placing the coral in your cart does not reserve it for you. You must completely check out before you receive a confirmation email from the site stating that it is yours. We will not be combining orders from different users. If you would like to share a box with someone you must have to do it under the same account. Shipping will be a DISCOUNTED 19.99 for Florida residents or 29.99 for out of state. This is the lowest shipping we've offered all year! You do not have to buy a shipping module, just check out and select whichever shipping is applicable to you. On every subsequent transaction just add them to your existing shipment. Make sure to select the correct delivery date. If you need to make a change please email us at onlinesales@topshelfaquatics.com at least 24 hours before your order ships. If none of the open dates for ship out are convenient for you, select a shipping date and write your preferred date in the order notes. We will change it for you when we combine orders. Local pick up begins Tuesday February 5th. If you email us the day and time you want to pick up your order we can have it pre bagged for you. Is buying a messy tank worth the effort? I have had a 14 gal bio cube for the last 5+ years and I am thinking about making the jump to a much bigger tank. I am thinking about going used to save thousands. I found a tank that is working, but appears to be filled with slime algae and who knows what else I will find when I look in person. My question is: how much effort will I be putting in to get this thing functional. Will I be strapped with nasty diseases forever and will it be worth the "savings"? Link to tank: https://offerup.com/item/detail/564834272/ I have learned from research it is an Aqueon 72. Not sure what all was done to get to functional for salt or if the lighting will suffice. I assume it will. Will be interesting if this tank that been for sale for over 3 months sells "all of the sudden"
Let's get a TWO PART discussion going! Question for today! Two Part Calcium and Alkalinity Questions for those of you who dose! 1. How much are you dosing daily? 2. How much water volume do you have? 3. What is your target DKH and Calcium? 4. How heavily is your tank stocked with SPS coral? 5. What are the biggest pros and cons you have found with two part dosing? The BIGGEST challenges to keeping a coral reef in your house! As a keeper of reefs there are certain challenges that we all WILL face from time to time. Those things that challenge us might not be as challenging to others and some things maybe not at all. I wanted to hear your thoughts on the following question. What are the biggest challenges, FOR YOU, in maintaining a healthy saltwater tank? Poll: How many reefers have successfully kept a butterfly? If so, what kinds of butterfly fish have you been successful with? So you're how old and you have a saltwater aquarium? I was thinking about ages and demographics of us crazy reef keepers and I thought it might make an interesting discussion about age. More specifically I'll kick it off with this question. What, if any, does age have to do with maintaining a saltwater reef aquarium? I'm also adding a poll about your age because it's been a while since we had one! Would love to hear your thoughts on this subject. I know everyone loves the leds for this reason and that reason but With Metal Halide being a proven winner over the years why does it seem its a dying breed? I see a few people swear by them and see great growth as its the closest thing to the sun but I know they do use a lot of power and put off heat compared to leds. After getting in and out of this hobby many times over the years, I would like to get a set up going but I really want to go with metal halide and t-5's because I like the look and I know they work good, but my hang up is It will be a very slow process to get enought corals to justify the cost of bulbs and electricity. With that being said, if just having a few corals to start will it be over kill to use mh/t-5? CALI KID CORALS JAN 19th LIVE SALE!!! SHIPPING: Shipping Modules are available NOW for purchase at a discounted price on our website https://www.calikidcorals.com/collections/r2r-live-sale. From now until Tuesday 1/14 shipping modules will be $29.99. After that, the price will increase to $34.99 until Friday, 1/18 at Noon PT. Day of sale purchase will be at the regular price of $44.99. All shipping modules are for Fedex Priority Overnight. Our normal shipping DOA policy applies. Local-pick is available for So-Cal Residents. Select Local pick-up at check out. RULES: All corals are WYSIWYG. A picture of the coral will be posted along with a link that will take you directly to our website for purchase. You must complete the check out process to secure the piece. Once purchase is confirmed, item will no longer be available and will be listed as "SOLD OUT. All orders are FINAL. No gift cards, certificates, or credits can be used on this live sale. RAFFLE(S): Raffles will take place soon after the Live Sale. Winners will be announced on this thread! Each item purchased will give you a raffle entry e.i. 10 items purchased = 10 tickets. for a quicker check out process during the Live Sale. We are looking forward to an awesome Live Sale! Is the Local Fish Store more or less important today? If you're like me when you started this hobby you couldn't stay away from the local fish store. Matter of fact my wife knew that when we traveled one of the things we were going to do is visit any local fish stores we were close to. It is well known that the local fish store has provided a great deal of worth the the hobby as a whole. In fact without them we may or may not be here today talking about reefs on this forum. Traditionally LFS has been of utmost value and even today many people can't keep aquariums without them. Is the Local Fish Store of more, less or the same importance today as any other time in history for the saltwater aquarium hobby? 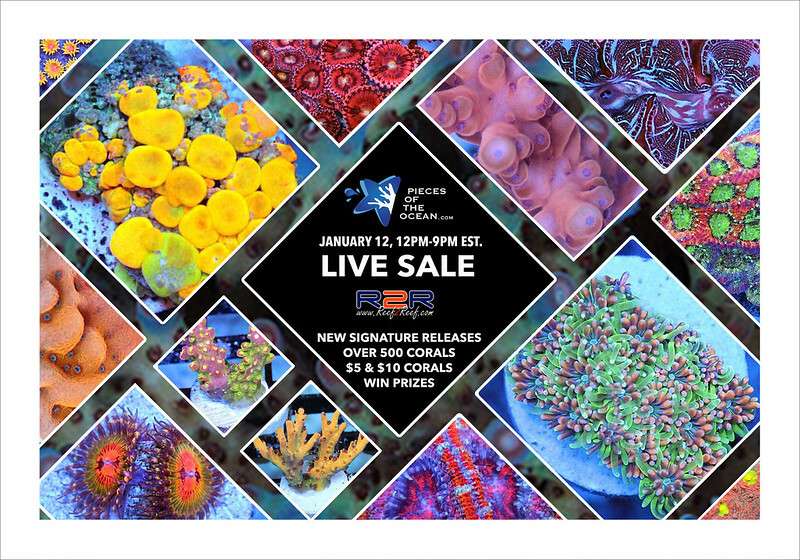 Pieces of the Ocean LIVE SALE 1/12/2019! 3. In the post, tag 3 friends AND us @PiecesOfTheOcean. Remember to tag us or we can't see your post. * The winners will be selected by random before the sale starts on Saturday. We will announce the winners here, and deliver the $50 coupon code via DM/PM on Instagram or Facebook. Good luck! The live sale will take place in this thread. We will post a link, price, and image to each coral in real time that you can purchase from our website. Everything is WYSIWYG, and first pay first serve. You must have an account registered on our website to make a purchase. So make sure you are logged in and ready as items will get sold fast. Pricing on the website will be correct in case of any typographical error. All communication will be conducted via email to support(AT)piecesoftheocean.com. No PM will be answered during the Live Sale. No other prior credit or coupon code can be used in this Live Sale. Our standard Guarantee Policy applies. No cancellation or substitutes on Live Sale orders. One ship out box per customer/no combining ship outs. You can however pick up for your friend. All rules are subject to change up to the start of the live sale. We will be giving away lots of goodies during the sale at random, so be sure to stay in it as much as possible. You never know what you can score while others are not looking! There is no free shipping in our live sale. Our standard shipping fees apply ($20 for NY, NJ, and CT, and $45 everywhere else). You only have to pay shipping once when you check out the first time. After you will choose "Local pickup or combine with an existing order" so you don't have to pay shipping again. You must choose a shipping date and pay shipping on your first item or we will not know when to ship your order. Below is a screenshot of what you will see when you check out. Local pick up is not only welcome but encouraged during our normal business hours. Get 20% off (in store only) on any fish purchase made in store when you pick up your live sale orders! What’s your average monthly tank expense(s)? Having a small piece of the ocean is an ongoing expense for most. Majority of us do not look at this expense as anything negative but rather an investment to be proud off. To start the thread, I think I land in the $101 - $150 range, with $20-50 being spent on maintenance and I try(!) to spend less than $100 on new corals every month. Sorry if similar pool/thread has already been created. Most Overrated and Underrated "CORALS!" We've all seen coral that we like or don't like, got to have it or don't want it. Some are overrated and some are underrated. Of course most of this is a matter of opinion but there are those corals that most might consider to be overrated or underrated for various reasons. Could be because the coral does or does not look good in photos, could be because the price is too cheap or too outrageous, could be be because of how slow or fast it grows, etc. Taking these things into consideration what coral would you consider to be overrated or underrated? Could be a named piece or a whole type of coral. What "New Thing" are you going to try on your reef tank this year? The cool thing about this hobby is that there are a million ways to do the same thing! Or so it seems. Since this is a hobby and something we do for fun getting to a place where it's "set it and forget it" is not always the most fun or most successful. Sometimes but not all the time! is there a store to buy R2R gear like decals and shirts? Will acans be the 2019 fad? I’ve been seeing a lot of them!